The eye contour area is a circle that reaches from the inner corner of your eye to the outer corner below the end of your eyebrow. It includes the area underneath your eye as well as up to your brow bone. When applying makeup, this is an important area to focus on to make sure that you enhance the natural brightness of your eyes. Caring correctly for this area of your face and enhancing its natural beauty will make you stand out from the rest. 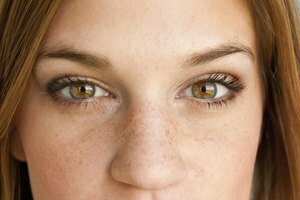 The skin around the eye is nearly twice as thin as the rest of the skin on your face. It also is in perpetual movement and produces less moisture than the rest of your face, so it is the first skin to sag and wrinkle. Therefore, this area requires extremely careful care. Caking a lot of makeup on the eye contour area and then failing to remove it and care for the skin will result in rapidly diminishing beauty. High-quality moisturizing creams with high SPF can help combat the effects of aging. Dark circles in the eye contour area come from two sources: concentration of blood and lymphatic vessels near the surface that can cause bluish shadows, and waste or fluid that was not successfully eliminated during the night, which usually causes "bags" or puffiness under the eyes. To encourage draining and circulation, first apply a warm compress to the eye area, and then apply an eye gel using a tapping motion starting from the inner corner of the upper eyelid all the way out and around to the lower lid. To mask shadows, use an eye brightener cream all around the eye. Use a light base all over the eye area from under the lid all the way to the brow. A champagne or pearl-colored base will complement most skin tones. Then, use a more intense but still light color to line the lower lashes and inner corner of your upper lid. A gold or silver color will work well for an everyday look, but try bright green or lavender if you are feeling bold and want to bring out your eye color. Apply a complementary darker color onto the outer half of your upper lid. Concentrate your makeup brush or cotton swab on the indentation below your brow bone to make this area darkest. 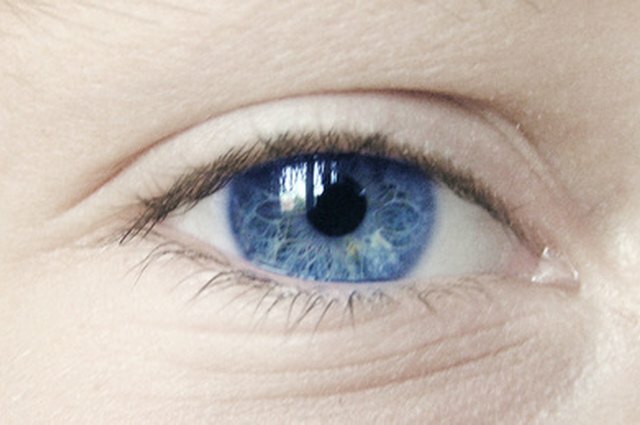 This will make the area around your eyes more defined, and help your eyes pop. If you are going for a more intense look, apply a bit of black or dark brown shadow to the outermost corner of your eyelid, very near to the lashes and just slightly into the crease. Applying too much dark eyeliner all the way around your eye can actually make your eyes look smaller. Apply a dark eyeliner starting thinly in the inner corner of your upper lash line, gradually getting thicker as you move to the outer corner. On the lower lid, apply the darker liner only to the outer half of your lash line. Normal face cleansers and soaps are too harsh for the delicate skin of the eye contour area. Choose a gentle eye makeup remover that is appropriate for your skin type; it is safe to start with a hypoallergenic, oil-free type if you are not sure what your skin type is. Use a soft cotton ball to remove the makeup on the eye contour area and a cotton swab to remove mascara. Dab lightly and do not scrub. You do not want to encourage dark circles after coming so far with your routine! Molly McPherson has written academically and professionally since 2005. She is contributes to eHow, writing on topics ranging from international economic policy to travel tips. An online fund-raising professional, McPherson holds a Bachelor of Arts in politics from the Catholic University of America and is pursuing a Master of Arts in international trade and investment policy from The George Washington University.